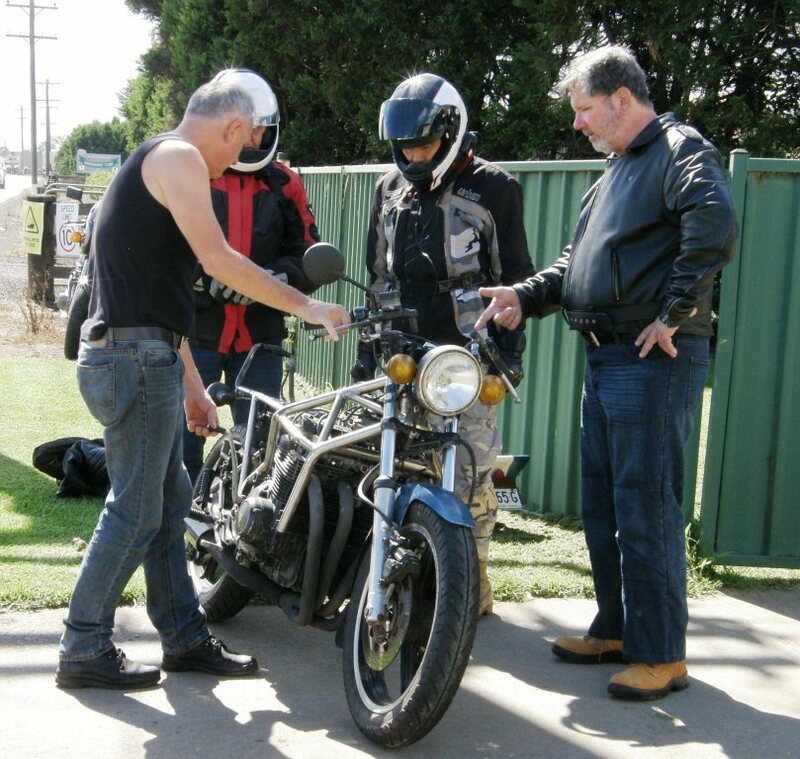 A report from Down Under with some news and novelties…. My brother has been keeping this piece of knotted pile weaving for me for many years. How it came into his hands is a long story which I have told on this blog before. All we need to know is that there is a weaver out there somewhere in Sydney who created this piece of amazingly dense cut pile weaving and I wish I knew who it was. 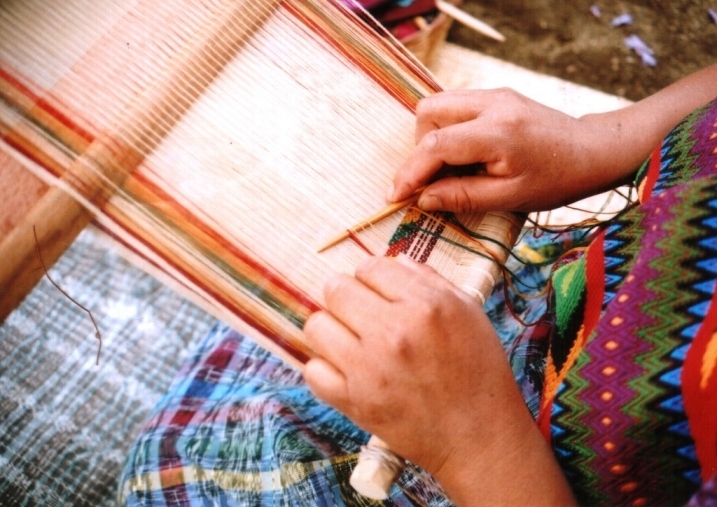 On top of the piece you can see the tools which are used for this weaving technique. I got them some time ago from a gentleman in South Australia who was studying the cut pile technique with an Afghani weaver. Through him I was able to buy the tools from his teacher. They have been on quite a journey….from Afghanistan to Australia and now on to Bolivia. 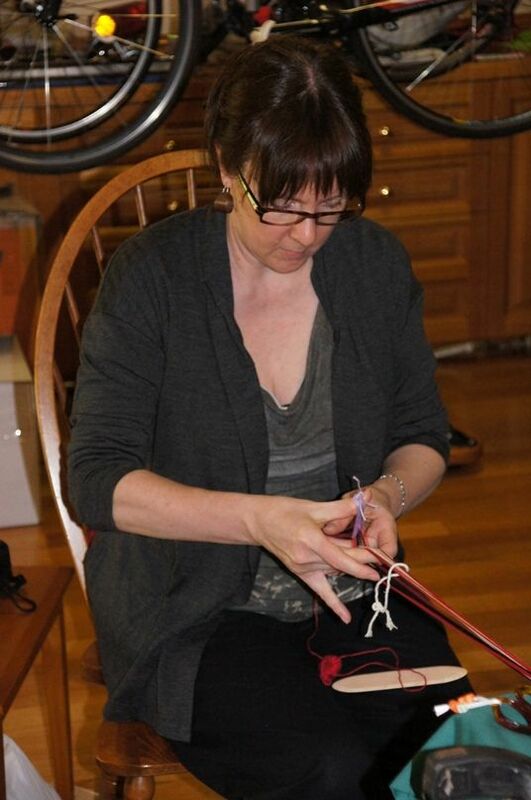 Some other “stuff”that backstrap weavers may find interesting…I discovered that Japanese chopsticks make pretty good pick-up sticks for lifting warps when doing weft inlay as well as for hooking the supplementary weft and pulling it through the shed as my teacher, Lydia, is doing below. 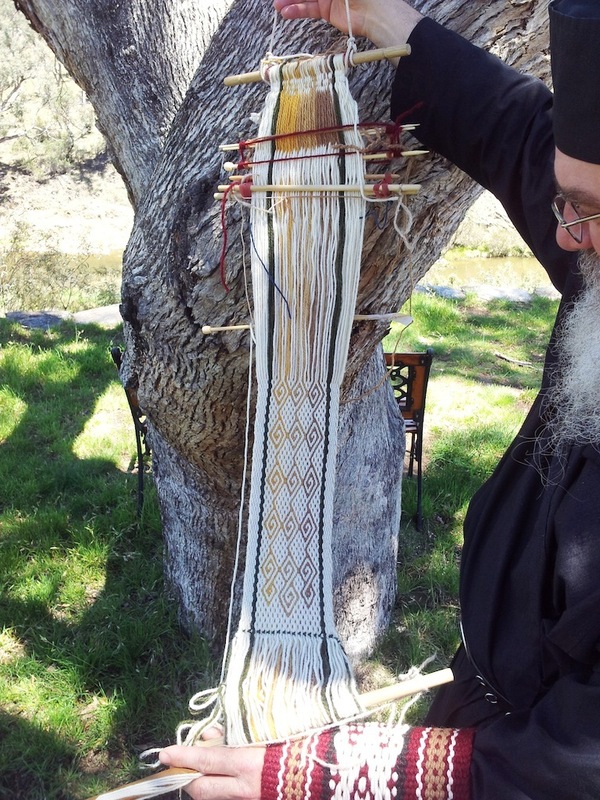 Fr Kyriakos, who lives here in Australia, cut and beautifully finished some forked sticks for me so I can take back some pieces of Australia to use in my backstrap weaving. Forked sticks are sometimes used by weavers in Peru, as seen at left, as an aid to opening the hedddle shed. The weaver is twisting the forked stick (which acts to tighten the upper layer of threads), leaning forward to relax tension on the lower layer of threads and lifting the heddles. I have been hunting for just the right forked stick! The implement on the right in the picture above is actually a pair of wooden tongs that I found in a knick knack shop in Vermont. Lausanne gave it to me as a gift. It seemed like a good useful souvenir and will serve well as my tanka (Quechua for fork) when I weave the ñawi awapa tubular band. It seems that a good forked stick is not that easy to come by even for the Andean weavers…. This weaver told me that she had broken her tanka while weaving her ñawi awapa and, rather than hunt for another, had simply bandaged it up. The other little novelty seen above is releasable cable ties. 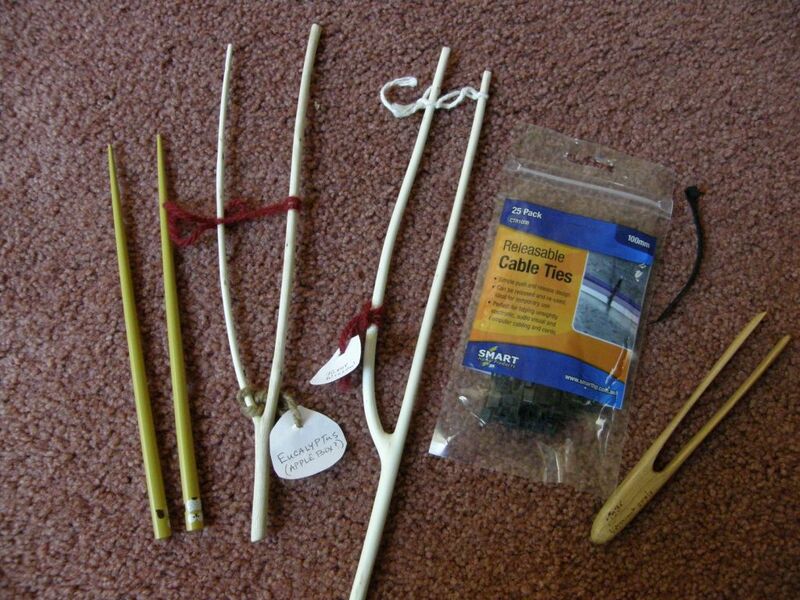 I have recenly taken to using cable ties to lash my warp to the loom bar and the fact that the ties can now be easy to release and, therefore, reuse is great news. As usual, when I am traveling, textiles from near and far just seem to fall into my lap. Kind folks bring these things along to guild meetings and other gatherings and thus give me the opportunity to examine and enjoy them. 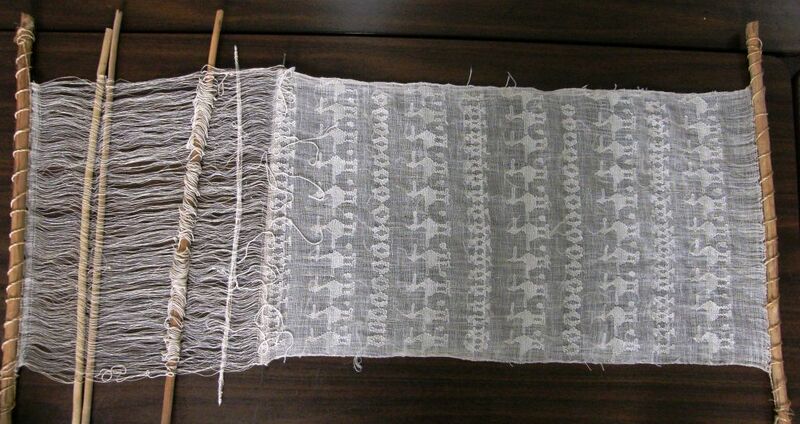 This is the second time in recent months that a piece like this has come my way…gorgeous light cotton open weave with motifs created with supplementary weft ….from Guatemala. This is just like the little sample piece that I bought on its loom at the Santa Fe market. 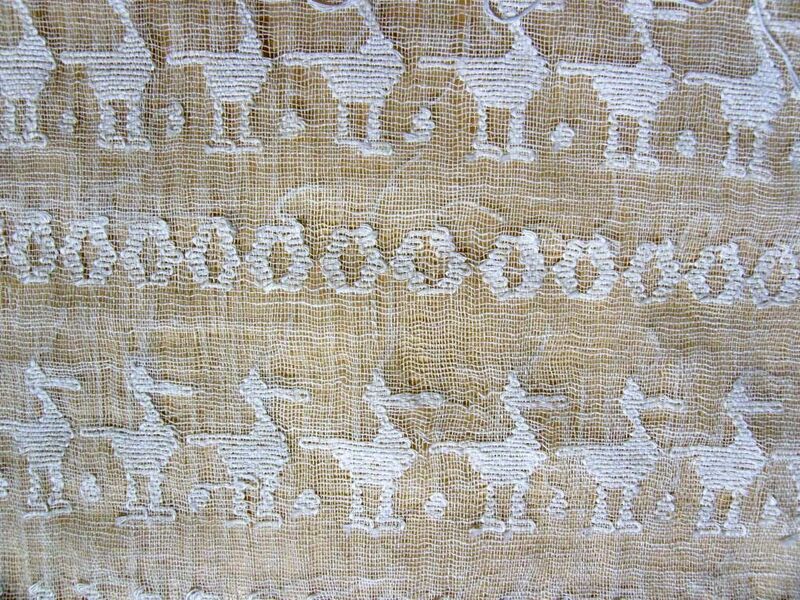 It was even more impressive in this larger version.Panels of this cloth are sewn together to make huipiles (blouses). 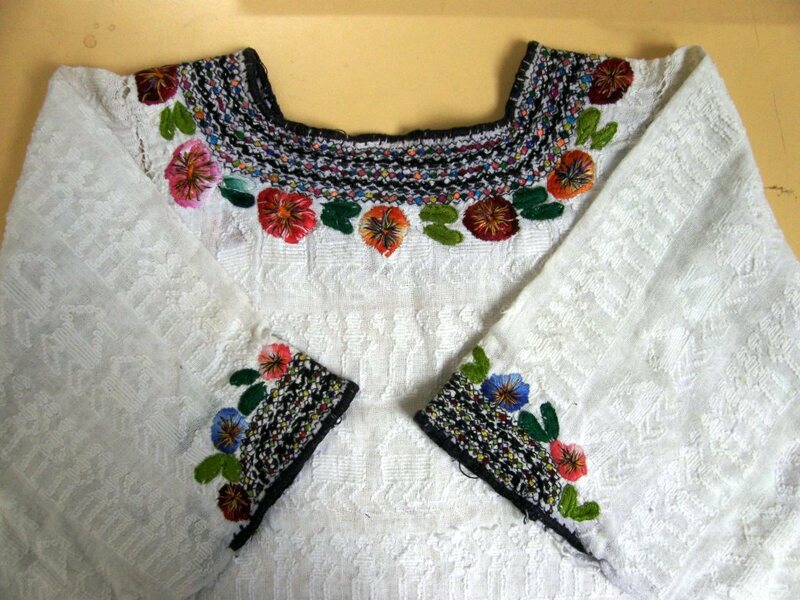 Weavers in the community from which this fabric came, embroider the edges of the neckline and sleeves. The thread on the loom was sized and was quite stiff. It was lovely to be able to feel the softness of the cloth in the finished huipil and see how much the open airy weave had closed after washing. So, here I am in Australia looking at Guatemalan weaving. 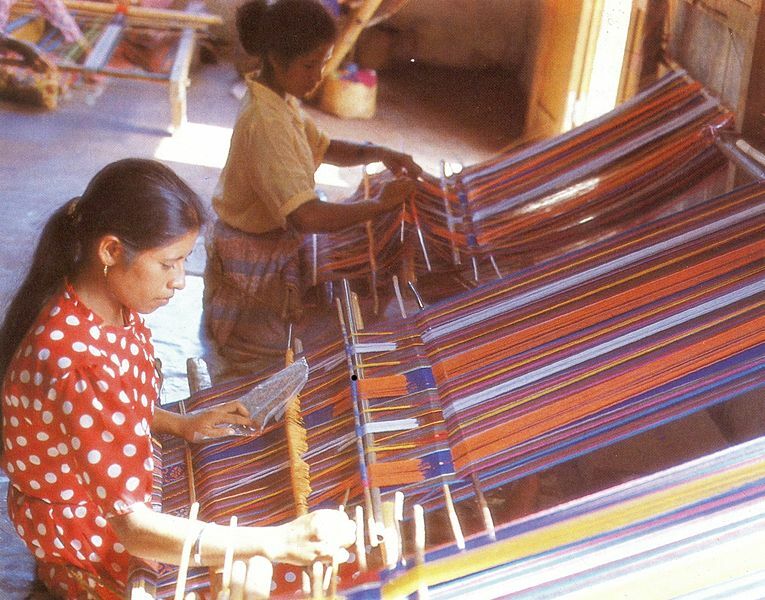 But, I also got to look at backstrap woven fabric from one of Australia’s near neighbors….Timor Leste, East Timor. Kelcie came to weave with me at home and brought along just a few of the textiles that she bought on a tour she recently took on the island of East Timor. 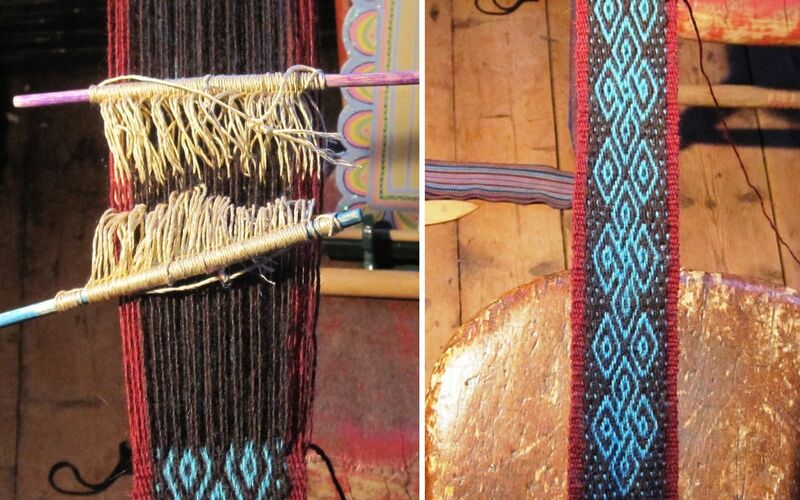 The pieces were all warp-faced and were either ikat or patterned with warp floats on one face. 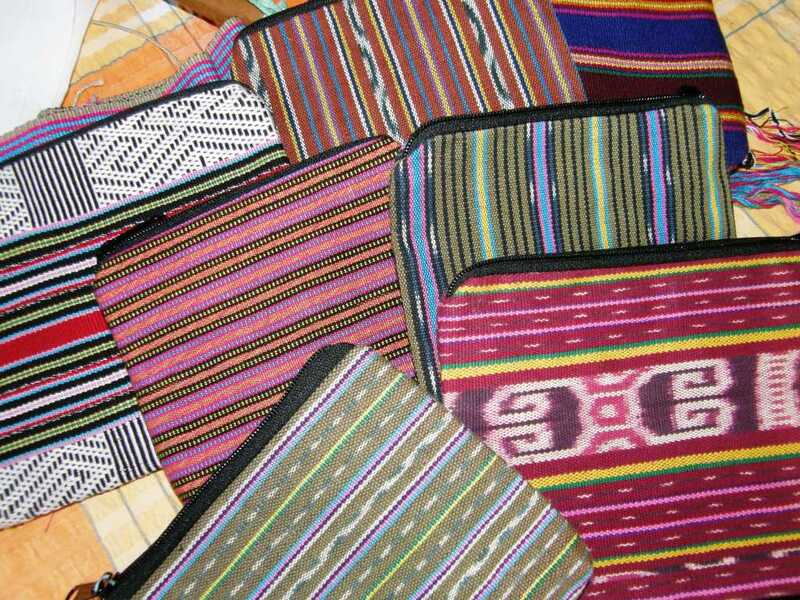 The Alola Foundation, in the capital city of Dili, was estabished to help improve the lives of women and childern in Timor Leste and marketing products made from handwoven cloth is just one of their activities. 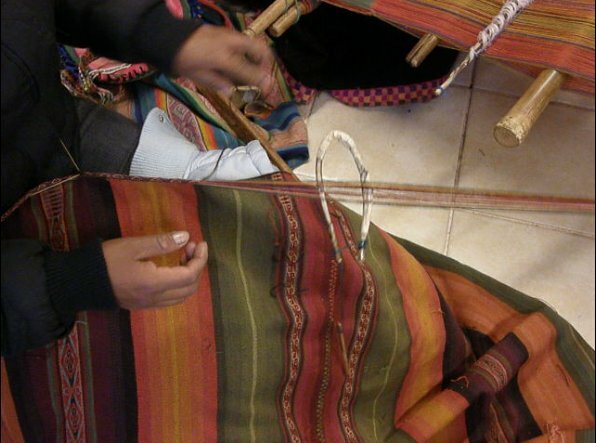 Traditional cloth that is used for men and women’s clothing is known as tais. 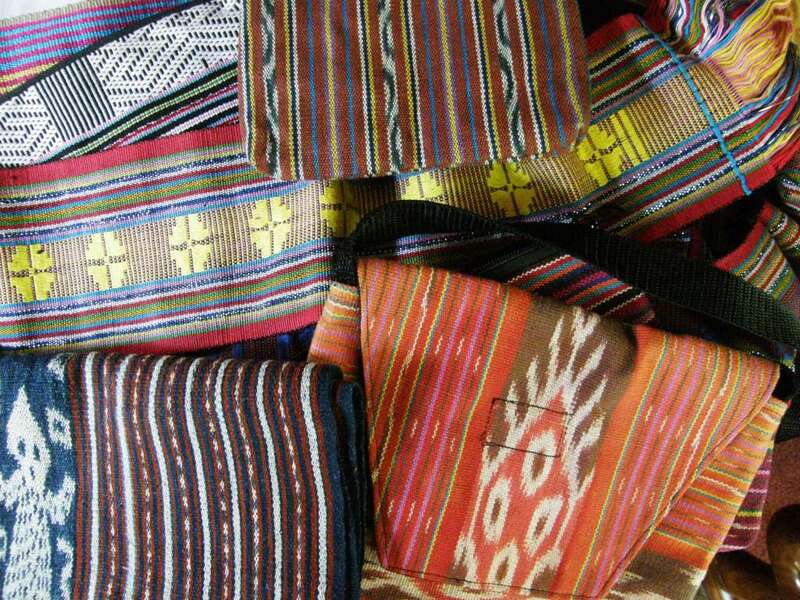 Take a look at the Wikipedia page on Tais to read more about the use and significance of this cloth in Timorese culture. 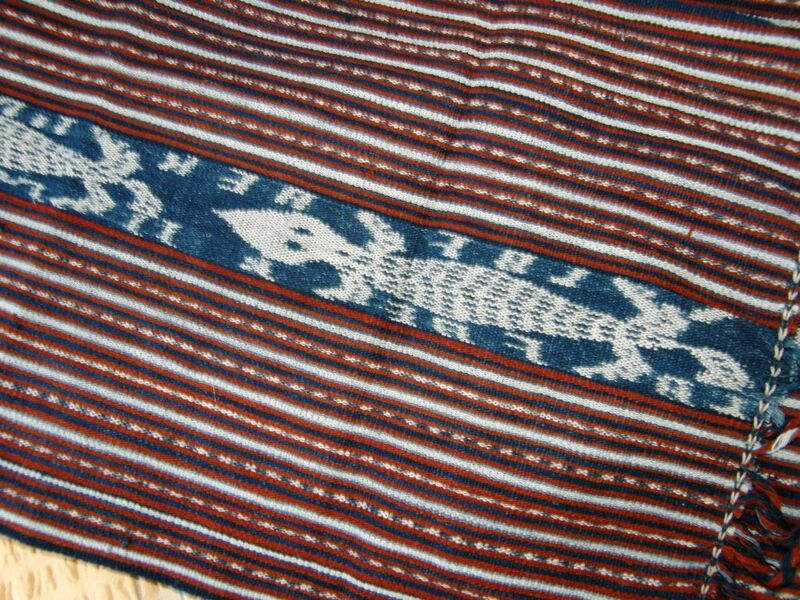 This piece depicts a crocodile in ikat, the creature on which the creation legend of the island is based. Kelcie’s collection included several long narrow pieces, like the one below with yellow warp float patterns, known as selandang which are worn around the neck. The ETWA Foundation website has pages that cover the weaving processes starting with the preparation and spinning of the cotton, the futus (ikat process), warping and weaving. 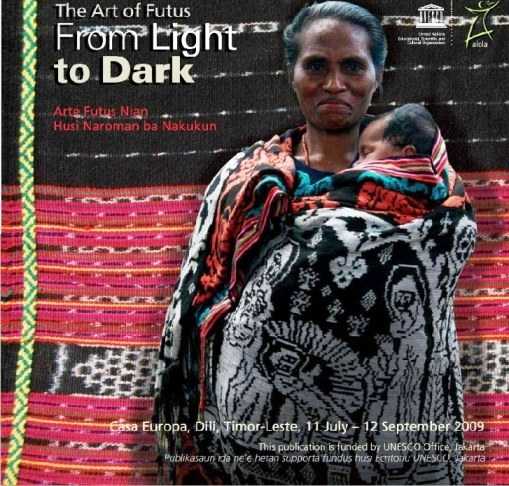 This book, which was produced by Alola and UNESCO to accompany an exhibit of textiles woven with the futus technique, is available as a free download here. 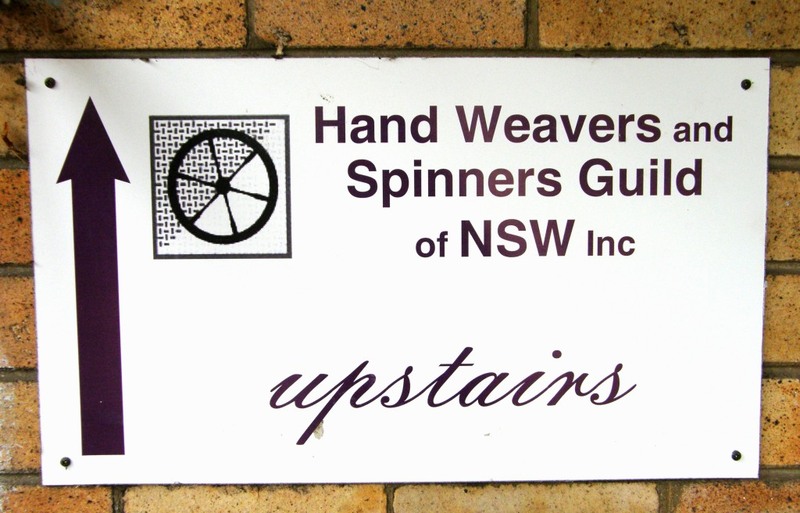 The folks at the Handweavers and Spinners Guild of NSW have been wonderful. This has been my first visit to Australia since trying to become a full-time weaver and my first contact with the guild. I was invited to a gathering of spinners the day after I arrived in Sydney and I took myself along before jet lag could set in. It was a dreary rainy day in Sydney and I thought that no one was going to show up as I sat alone in the church hall. What I hadn’t found was the clear sign that indicated that all the fibery folk were atually upstairs happily carding, spinning, chatting, drinking mimosas! showing-and-telling and celebrating the last meeting of the year. 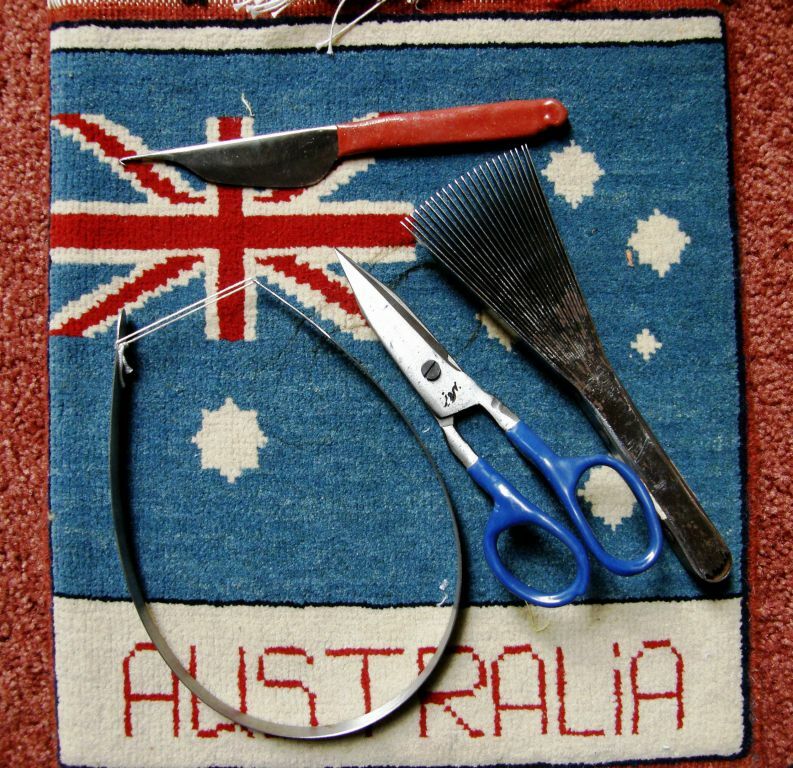 There I met Dace and I had the sudden idea of weaving something to commemorate my Australian visit. I asked her if there was any fabric or material or weave structure that would be considered classically Australian. It was hard to come up with something. And then Dace had the idea of dyeing some of my yarn with native Australian trees, instead. Brilliant idea! And so I will be off to Dace’s place for a dyeing session next week. Next came a small gathering of weavers at home. Space would only allow four.. We spent two days playing with the ways that weavers in Peru and Bolivia set up their looms to weave complementary-warp pick-up patterns. You can see Jen at left using the two-finger method. The pool table was a great piece of furniture for anchoring the warps. You need very large clamps. That table was not going anywhere! Taking a break to chart some patterns and look at books and Kelcie’s Timorese textiles…..
Our get-together was followed by the monthly (and end-of-year) guild meeting at which I showed some slides. It was a wonderful, warm and jovial audience full of Christmas cheer for the coming holidays. 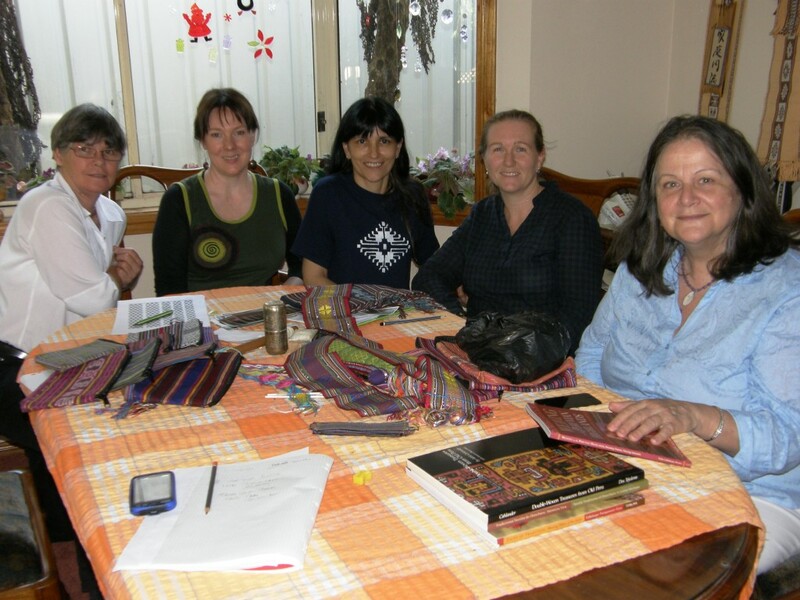 I was delighted to meet so many people who had never encountered South American weaving and who then expressed so much enthusiasm for it. Fr Kyriakos (who just happened to have joined Kelcie as a student in one of Kay Faulkner’s classes…it’s a small world in this big country,of Australia!) sent me pictures of the Andean Pebble Weave band that he is weaving using a pattern inspired by a piece I showed here some time ago woven by Julia. Lausanne in Vermont showed me what she is working on. She’s having a little trouble with sticky sheds as she is using respun tapestry wool. 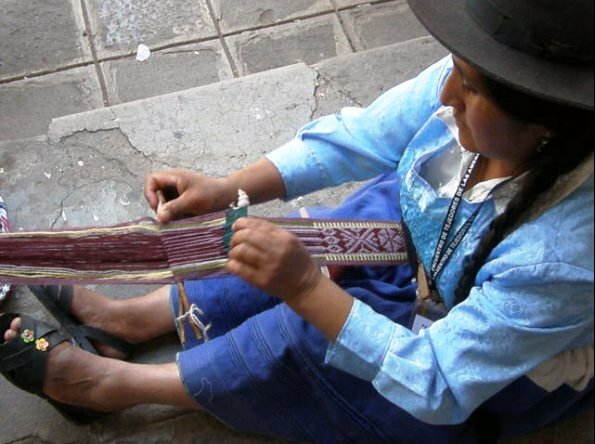 Working the two sets of heddles used in the Andean Pebble Weave takes practice. I sawed my way through my warps while trying to perfect the moves in my lessons back in 1996. My teachers performed them so quickly and without any explanation. It was difficult to identify the individual movements that needed to be combined into one smooth operation. Lausanne is weaving a Celtic knotwork pattern that I adapted to Andean Pebble Weave from tablet-woven bands. It is charted in my second book, More Adventures with Warp-faced Pick-up Patterns. After the guild meeting last Saturday, I couldn’t help noticing with a smile the contrast in my Saturday and Sunday activities. 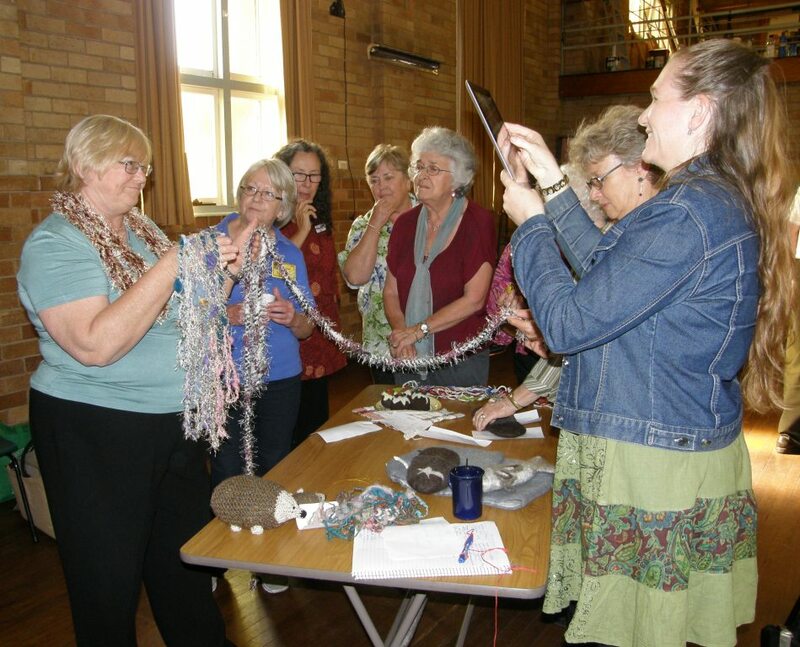 An interested group gathers around the table after Show and Tell time to get a closer look at the novelty yarn that had been presented. (Of course there are several male members of the guild…they are just not visible in this particular shot). And on Sunday it was a day with Boys and Their Toys: (of course, there was also a female present, namely, ME. 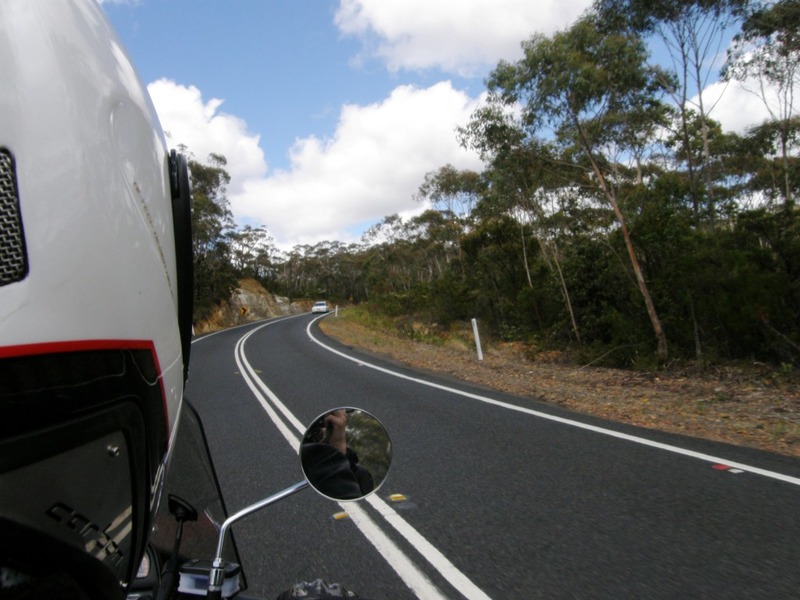 For those who are familar with Sydney, my brother took me on a ride with his vintage motorcycle club up to the mountains…Mt Victoria and the Bell’s Line of Road. 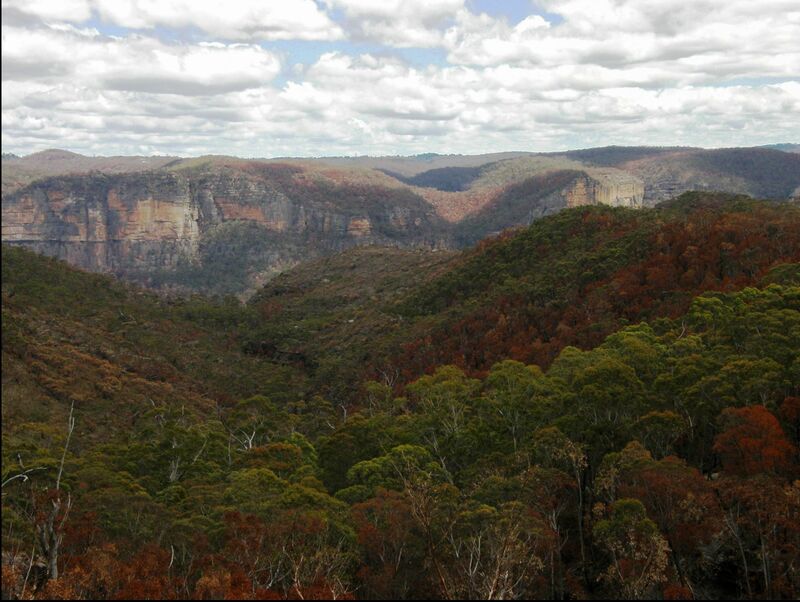 It is such a beauiful area and could well be where I would choose to live should I ever come back to Australia for good. Yes, we are on the correct side of the road. It’s Australia, remember? The colors in this bush scene look almost like the early fall in the US that I saw recently but, sadly, all those orangey-red tones that you see there are burnt bush from the recent fires that ravaged the area. Those cliff faces and bushland are some of my favorite parts of Sydney. Who needs the beach?! This Saturday I will be heading back to the mountains for a small weavers’ gathering in the home of Helen Halpin, this time by train. 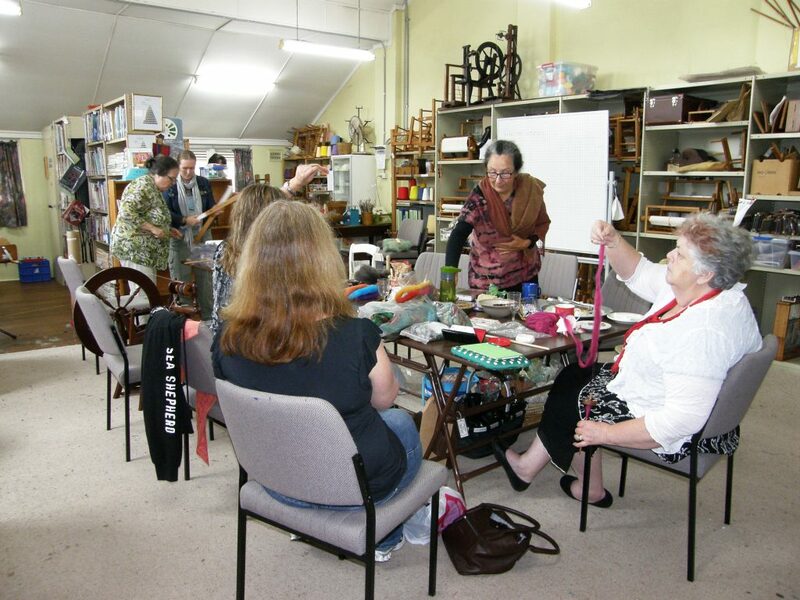 I have been receiving Helen’s monthly news letter of weaving and other fiber events in Australia, Weavers Forum, for some years now and was pleased to have been able to finally meet her at the guild meeting last Saturday. I certainly won’t let four years slip by before I am back in Sydney again. 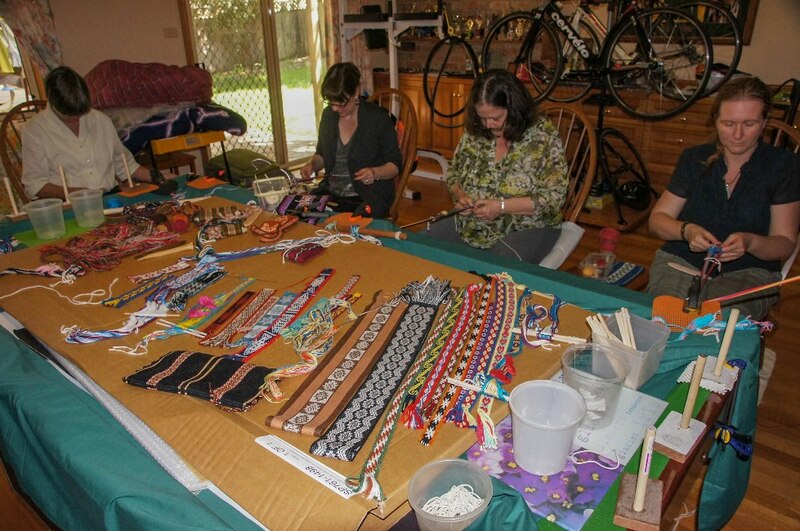 « Backstrap Weaving – Home! I can happily recognize that snake design guitar strap, black and white, on the pool table display… gorgeous! Hope you enjoy the rest of your Australian tour! And I happiy recognize the cat in your Gravatar. I hope she is behaving!